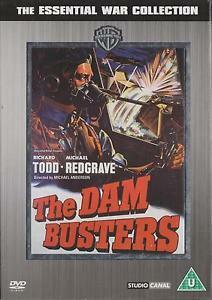 DVDs 24876 https://www.warplane.com/images/Products/24876.jpg Dr. Barnes Wallis was possessed with a seeming crazy idea - the creation of the bouncing bomb, designed to destroy the Ruhr dams and paralyze the enemy's industrial nerve centre. He fought persistent scepticism and disbelief that such a feat was possible. Through the matchless skill, determination and courage of R.A.F. Wing Commander Guy Gibson and his squadron, the mission succeeded. From today's perspective, the concept can only be described as one of brilliant inspiration. Thrilling action and riveting suspense are combined in the true-life drama of this heroic exploit, heightened with actual newsreels of the legendary raid. Description: Dr. Barnes Wallis was possessed with a seeming crazy idea - the creation of the bouncing bomb, designed to destroy the Ruhr dams and paralyze the enemy's industrial nerve centre. He fought persistent scepticism and disbelief that such a feat was possible. Additional Info: Runtime: 120 minutes. Black & White. NTSC - North America only.